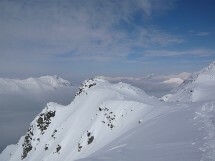 On Sunday, March 26th, I organize a snowshoe hike to Mount Jovet (south summit at 2362m). This summit of the Mont-Blanc range offers a breathtaking view of the Mont Tondu, the Enclave Head, the Beaufortin massif, and dominates the Jovet Lakes. We start from Notre-Dame de la Gorge (1200 m), take the Roman road, cross a remarkable bridge over gorges. We arrive at the Chalets de La Balme. At the EDF pylon we take a left towards the lakes and climb the southern ridge to the summit. A gradient of 1150 m and a distance of 15 km. Walking time: about 5 hours. If you do not have your own snowshoes, you can rent them in advance (for a list of rental places see http://www.sindy.ch/snowshoes.doc - in addition, there is Cactus Sports in Carouge).